It’s all about the Base. Violet.Dream.Luminous. VDL continues to do so through their latest product development in new skincare and in the reformulation and repackaging of foundation, keeping innovation in mind with the metallic series which I call “Smart Beauty”. When used together, they form VDL’s new Base Makeup Collection, which highlights the build-up and transition starting from the last step of skincare (using VDL’s latest premium hydrating and antiaging SKIN P+R=O Regenerative range) before moving on to the first step of makeup (the signature primer) followed through with foundation. 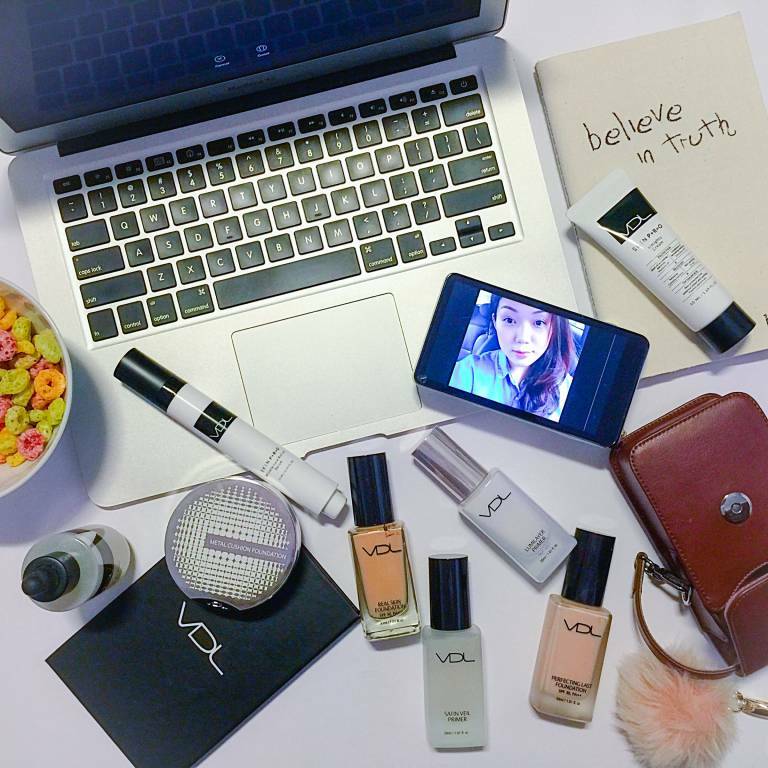 Here are the 3 steps in achieving flawless base with VDL’s Base Makeup Collection! Step 1. The start to layering, giving it a solid base. The focus is on the right skin care using the SKIN P+R=O Regenerative range; P to Protect skin, R to Recover and O for Optimal skin condition. Apply the Wrinkle Care Roll-on Serum (S$73 15ml) that comes with a metallic ball applicator on the eyes. I love the size of this “eye pen”, gives me great control/strength when I massage my eyes with the metallic ball applicator. Cooling and refreshing! Next is the anti-oxidant Almighty Ampoule Essence (S$88 50ml) which promotes collagen and reduces wrinkle formation. Top it with Almighty Cream (S$82 50ml), an ointment-type cream to seal and protect the elasticity within the skin. Skin feels soft, smooth and ready for the next makeup steps! Step 2. Enhance the staying power using Lumilayer Primer (S$36 30ml). First impression was the luminosity of this signature primer. I came to understand that it is due to the Lightflex Pigments that helps to reflect light off different angles of the face to create a mild highlighting and 3-dimentional face line. Love this lots! Step 3. Final step is foundation! And the two foundations in the series are (1) the re-formulated Perfecting Last Foundation and (2) Beauty Metal Cushion Foundation that sport a whole new “Metallic” design. The reformulated Perfecting Last Foundation is a HD Foundation (S$42 30ml) which provides long-lasting matte and high coverage while keeping the skin moisturized with its new Bio Moisture Layer. And indeed, it does not feel drying. It has SPF30PA+++ and comes in 4 shades. I’ve been matched A02. I’ve gained faith in VDL’s foundations since I enjoyed (still enjoying!) the VDLxMULE cream foundation the last time. Although that lasted slightly longer hours, this new Perfecting Last Foundation’s longevity is decent too and is more moisturizing and comfortable for long wear. Press and release! Yes, that’s how the metal plate* in this VDL Beauty Metal Cushion Foundation (S$52) works; releasing just the right amount each time when pressed. It leaves close to nothing on the plate (if any, just tissue off) which reduces contact point between the sponge and the foundation. Somehow I love the idea that the foundation is “fresher”& protected. How the formula is being kept cool and the moisture level maintained. Clean and sleek, this new 2015 packaging comes in a whole new “Metallic” design. Best of all, the foundation is also lasting with semi matte natural finish. Here’s my easy everyday look with the 3 simple steps/products mentioned (wearing the reformulated Perfecting Last Foundation in the final step). VDL’s new Base Makeup Collection is available at all stores, so do check them out!